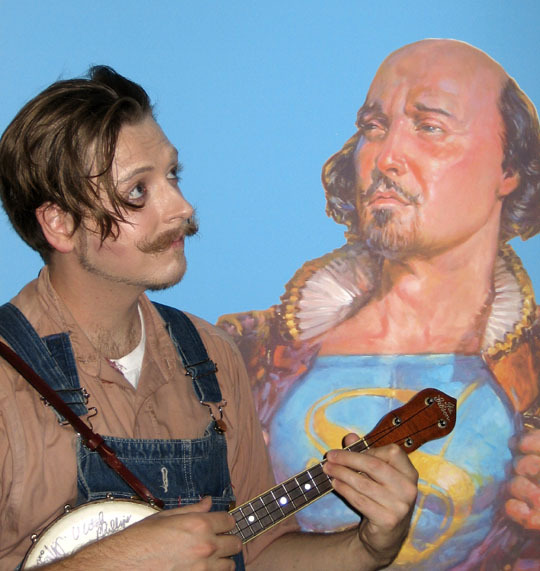 Ukulele Loki spins some old-timey Shakespeare. Aaron Johnson—better known by his nom de strum, Ukulele Loki—is a Renaissance man in more ways than one. The Boulder-based musician, writer, artist, and DJ has made a name for himself through his Route 78 West program on Radio 1190, his vaudeville variety act [Folderol Follies], and his many random appearances both solo and with his Gadabout Orchestra. But now Johnson is doing the Renaissance for real—kind of—as the composer and music director of the Colorado Shakespeare Festival’s updated-to-the-‘30s version of As You Like It. And while Johnson is quick to humbly point out his small role in the play, it’s his sensibility, style, and love of both Elizabethan theatre and Depression-era culture that helped the production’s anachronistic elements cohere into a weird, warped whole. The A.V. Club: What was your first experience with Shakespeare? Aaron Johnson: I’ve been involved in theatre all my life. My mother started taking me and my sister, when we were little kids, and we would smuggle in pillows so we could see over people’s heads. But my first exposure to Shakespare was doing scene work at theater camp when I was 11 or 12. Around the same time, I saw the film version of Hamlet, the Mel Gibson one. 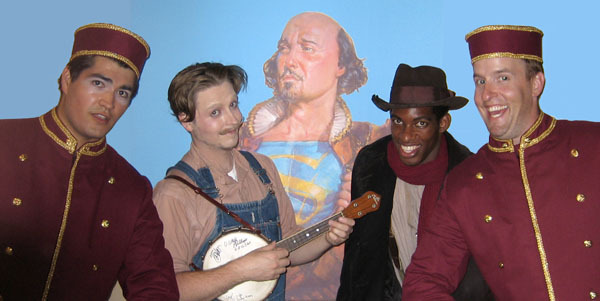 Then, at theater school, I did a scene from Rosencrantz & Guildenstern Are Dead. Seeing Shakespeare with a more contemporary spin and sense of humor really showed me all the possibilities of his work, and I’ve been hooked ever since. AVC: Are you a fan of all the recontextualized Shakespeare that’s been done over the past few years, like Baz Luhrmann’s Romeo and Juliet? AJ: I’m studying to be an English and theater teacher, and for that reason, I’m fine with that version. I think it’s a fun way to get people to watch Shakespeare who might not otherwise. When you’re recontextualizing Shakespeare, the whole idea is to figure out the theme behind the play and try to find a way to express that. If you’re just saying, “let’s do Romeo And Juliet and set it in outer space, just because I love outer space,” that’s going to be pretty stupid. But if you can do something like West Side Story, I think that works very well. Shakespeare wasn’t some kind of traditionalist. He would take a story from a completely different culture, like commedia dell’arte, and dress everyone in Elizabethan clothes. If it’s done by a good director who has a reason for doing it, a contemporary approach to Shakespeare can be brilliant. AVC: Whose idea was it to set As You Like It during the Great Depression, and how did you get involved? AJ: The director, Gavin Cameron-Webb, had this great idea to se it in the 1930s. As You Like It is about a group of people who have fallen from wealth and are banished to the forest. You have all these people from the court who are now slumming, hanging out with shepherds in the woods. By setting it in the ‘30s, Gavin Cameron-Webb sets up this interesting contrast between Hollywood screwball comedies of the time like My Man Godfrey, that illusion of wealth, and the reality of hobos and the Great Depression. I’ve been playing music from the ‘20s and ‘30s on the ukulele for years, so when I heard the concept, I was very interested, and I got in touch with them. AVC: Were there any composers that influenced the music you wrote for the production? AJ: I’m a huge fan of (lyricist) Gus Kahn /(composer) Walter Donaldson, the Gershwins, Irving Berlin, Cole Porter. That style of music is a lot of what the sound designer, Kevin Dunayer, wound up using for the background. But what he wanted from me was something a lot more rough and rural. Usually I play the ukulele, but I ended up using my 1927 Gibson banjo-ukulele, this mini banjo that’s tuned like a ukulele. I thought it had more of a rustic, Western-swing sort of sound. There’s one song, “Blow, Blow,” that I set more like an African American spiritual or work song. One of the songs we do is a total country hillbilly hoedown, which is a lot of fun. Basically I’m this homeless minstrel who wanders around onstage with the other hobos, singing songs. AVC: How does a play written in 1600 and updated to the 1930s resonate today? AJ: I’ve noticed a lot of revived interest in that era, in vaudeville and burlesque and live entertainment like that I don’t know it it’s a reaction to today’s overproduced, slick music and movies, or if maybe there are some interesting parallels happening politically—economic bad times and all. Mostly, though, this play is a comedy. It’s there to be fun and entertaining. As with all good comedies, this one deals with all kinds of mishaps: banished people and betrayal and love and mistaken identity and gender bending. There’s plenty to come and laugh and gawk at without being a nut for iambic pentameter.